[%image feed-image float=left width=200] The latest in agricultural identity theft: Marionberries for sale in Oregon have been discovered to be mixed with — gasp! — the ordinary blackberry. So what's the big deal? Marionberries taste better than blackberries and command a higher price, so it's that age-old story: consumer fraud. Should you be concerned (or unable to get to a u-pick berry farm near you), take a look at the berries in the pint basket; marionberries generally have longer bodies than blackberries. 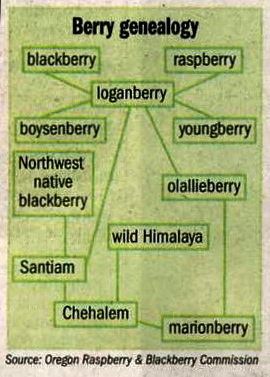 Or simply ponder the complicated family tree of the blackberry-raspberry clan, at left.